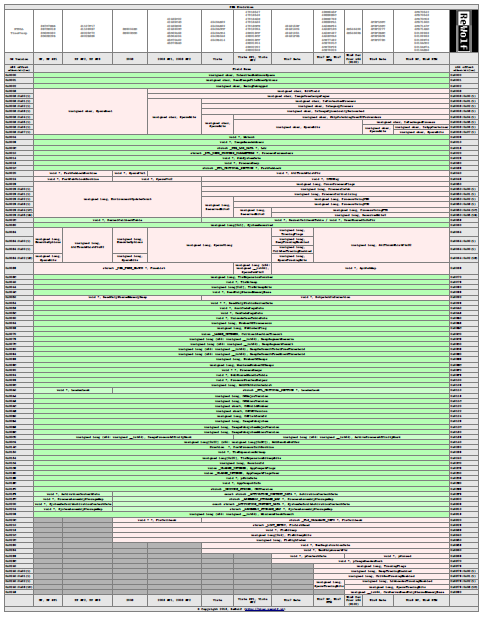 Left column of the table represents x86 offset, right column is x64 offset, green fields are supposed to be compatible across all windows versions starting from XP without any SP and ending at Windows 8 RTM, red (pink?, rose?) fields should be used only after careful verification if they’re working on a target system. At the top of the table, there is row called NTDLL TimeStamp, it is not the timestamp from the PE header but from the Debug Directory (IMAGE_DIRECTORY_ENTRY_DEBUG, LordPE can parse this structure). I’m using this timestamp as an unique identifier for NTDLL version, this timestamp is also stored in PDB files. Above version is system independent as all fields that are changing across OS versions are marked as _SYSTEM_DEPENDENT_xx. I’ve also removed all fields from the end that were added after Widnows XP. Great work! Really nice way to visualize it. Very thorough. It works for me. If it returns ‘403 Forbidden’ then try multiple times, some times there are some problems with my hosting. how can i know the base address of PEB in virtual memory. i tried to read that structure but i dont know exact location of PEB. There are some magic consts in above snippets, but at least You don’t need to define TEB32/TEB64 structures to use them. Third snippet may not work on Windows 8+, I can’t test it on this platform at the moment. i am interesting the method how to collect different ntdll.pdb/wntdll.pdb files from various versions of Windows, i want to get other windows dll’s pdb for various versions of Windows, can you tell me ? thank u! Unfortunately it is not straightforward task :/ I was planning to describe my methodology, but it never happened. Maybe if I find some free afternoon I’ll finally write it down and publish on this blog, as it might be useful for some other people as well. Hi, how did you obtain all those versions of ntdll.dll. I was recently tasked with the same thing, but I wanted to obtain the syscall numbers; however, I was left with manually installing different versions of Windows to do it though. I was wondering if there’s a nicer way around that to obtain the ntdll.dll’s? Funny that this question pops up again in a very short time period. As I said in the comment above, it’s not straightforward procedure, but definitely it’s nicer and quicker than installing every windows in VM. I’ll try to push myself into writing blogpost that describes my methodology. Hi, I’ve also downloaded the symbols from https://developer.microsoft.com/en-us/windows/hardware/download-symbols and obtained offsets that way; but I’ve noticed these aren’t complete at all; plus the hashes mismatched between those and the symbols take a lot of hard drive space, since I’ve had to install all of the PDBs (although I just need the ntdll.pdb). This approach was way faster than manually installing the Windows systems, but still not perfect – although there probably isn’t a perfect method to begin with. However, I’m interested in what you’ve done to obtain your DLLs/PDBs. Hi, have you written the piece about obtaining all DLL/PDBs yet, I’m also interested in reading about it?